Ants in the Big Onion Give Away! 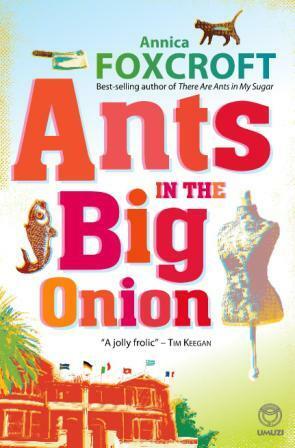 I received my copy of Ants in the Big Onion last Monday and I finished it on Thursday. Yes, it was that good. The best bit? Smaller print than normal, which means… more to read! May and Annica run a B&B called the Fox ‘n Zulu in Meyerton (Which is a small town lying 15 km north of Vereeniging in Gauteng, South Africa- just in case you were wondering- I did) and it details all the trials and tribulations of the group of individuals which live there. You get to re meet some of the original characters and if you were wondering where some of them had got to and how on earth May and Annica came to be running a B& B, don’t fret, it will all be explained in the first couple of pages. It is hilarious! The characters had me giggling at their antics and gasping at some, but really what else can happen when you throw a bunch of unique individuals into a small abode, oh and a lonely snake. 1) jot something down in the comments section and tell me what your favourite book of all time is. 2) follow us on twitter @thebookclubblog. 3) like us on Facebook. I will then get random.org to choose a winner next Saturday the 28th (that’s if we are still all here…;-)) and I will announce the lucky person.